Pesticides are substances that are meant to control pests, including weeds. The term pesticide includes all of the following: herbicide, insecticides (which may include insect growth regulators, termiticides, etc.) nematicide, molluscicide, piscicide, avicide, rodenticide, bactericide, insect repellent, animal repellent, antimicrobial, and fungicide. The most common of these are herbicides which account for approximately 80% of all pesticide use. Most pesticides are intended to serve as plant protection products (also known as crop protection products), which in general, protect plants from weeds, fungi, or insects. In general, a pesticide is a chemical or biological agent (such as a virus, bacterium, or fungus) that deters, incapacitates, kills, or otherwise discourages pests. Target pests can include insects, plant pathogens, weeds, molluscs, birds, mammals, fish, nematodes (roundworms), and microbes that destroy property, cause nuisance, or spread disease, or are disease vectors. Along with these benefits, pesticides also have drawbacks, such as potential toxicity to humans and other species. any substance or mixture of substances intended for preventing, destroying, or controlling any pest, including vectors of human or animal disease, unwanted species of plants or animals, causing harm during or otherwise interfering with the production, processing, storage, transport, or marketing of food, agricultural commodities, wood and wood products or animal feedstuffs, or substances that may be administered to animals for the control of insects, arachnids, or other pests in or on their bodies. The term includes substances intended for use as a plant growth regulator, defoliant, desiccant, or agent for thinning fruit or preventing the premature fall of fruit. Also used as substances applied to crops either before or after harvest to protect the commodity from deterioration during storage and transport. Many pesticides can be grouped into chemical families. Prominent insecticide families include organochlorines, organophosphates, and carbamates. Organochlorine hydrocarbons (e.g., DDT) could be separated into dichlorodiphenylethanes, cyclodiene compounds, and other related compounds. They operate by disrupting the sodium/potassium balance of the nerve fiber, forcing the nerve to transmit continuously. Their toxicities vary greatly, but they have been phased out because of their persistence and potential to bioaccumulate. :239–240 Organophosphate and carbamates largely replaced organochlorines. Both operate through inhibiting the enzyme acetylcholinesterase, allowing acetylcholine to transfer nerve impulses indefinitely and causing a variety of symptoms such as weakness or paralysis. Organophosphates are quite toxic to vertebrates and have in some cases been replaced by less toxic carbamates. :136–137 Thiocarbamate and dithiocarbamates are subclasses of carbamates. Prominent families of herbicides include phenoxy and benzoic acid herbicides (e.g. 2,4-D), triazines (e.g., atrazine), ureas (e.g., diuron), and Chloroacetanilides (e.g., alachlor). Phenoxy compounds tend to selectively kill broad-leaf weeds rather than grasses. The phenoxy and benzoic acid herbicides function similar to plant growth hormones, and grow cells without normal cell division, crushing the plant's nutrient transport system. :300 Triazines interfere with photosynthesis. :335 Many commonly used pesticides are not included in these families, including glyphosate. The application of pest control agents is usually carried out by dispersing the chemical in a (often hydrocarbon-based) solvent-surfactant system to give a homogeneous preparation. A virus lethality study performed in 1977 demonstrated that a particular pesticide did not increase the lethality of the virus, however combinations which included some surfactants and the solvent clearly showed that pretreatment with them markedly increased the viral lethality in the test mice. Pesticides can be classified based upon their biological mechanism function or application method. Most pesticides work by poisoning pests. A systemic pesticide moves inside a plant following absorption by the plant. With insecticides and most fungicides, this movement is usually upward (through the xylem) and outward. Increased efficiency may be a result. Systemic insecticides, which poison pollen and nectar in the flowers, may kill bees and other needed pollinators. In 2010, the development of a new class of fungicides called paldoxins was announced. These work by taking advantage of natural defense chemicals released by plants called phytoalexins, which fungi then detoxify using enzymes. The paldoxins inhibit the fungi's detoxification enzymes. They are believed to be safer and greener. Since before 2000 BC, humans have utilized pesticides to protect their crops. The first known pesticide was elemental sulfur dusting used in ancient Sumer about 4,500 years ago in ancient Mesopotamia. The Rig Veda, which is about 4,000 years old, mentions the use of poisonous plants for pest control. By the 15th century, toxic chemicals such as arsenic, mercury, and lead were being applied to crops to kill pests. In the 17th century, nicotine sulfate was extracted from tobacco leaves for use as an insecticide. The 19th century saw the introduction of two more natural pesticides, pyrethrum, which is derived from chrysanthemums, and rotenone, which is derived from the roots of tropical vegetables. Until the 1950s, arsenic-based pesticides were dominant. Paul Müller discovered that DDT was a very effective insecticide. Organochlorines such as DDT were dominant, but they were replaced in the U.S. by organophosphates and carbamates by 1975. Since then, pyrethrin compounds have become the dominant insecticide. Herbicides became common in the 1960s, led by "triazine and other nitrogen-based compounds, carboxylic acids such as 2,4-dichlorophenoxyacetic acid, and glyphosate". The first legislation providing federal authority for regulating pesticides was enacted in 1910; however, decades later during the 1940s manufacturers began to produce large amounts of synthetic pesticides and their use became widespread. Some sources consider the 1940s and 1950s to have been the start of the "pesticide era." Although the U.S. Environmental Protection Agency was established in 1970 and amendments to the pesticide law in 1972, pesticide use has increased 50-fold since 1950 and 2.3 million tonnes (2.5 million short tons) of industrial pesticides are now[when?] used each year. Seventy-five percent of all pesticides in the world are used in developed countries, but use in developing countries is increasing. A study of USA pesticide use trends through 1997 was published in 2003 by the National Science Foundation's Center for Integrated Pest Management. In the 1960s, it was discovered that DDT was preventing many fish-eating birds from reproducing, which was a serious threat to biodiversity. Rachel Carson wrote the best-selling book Silent Spring about biological magnification. The agricultural use of DDT is now banned under the Stockholm Convention on Persistent Organic Pollutants, but it is still used in some developing nations to prevent malaria and other tropical diseases by spraying on interior walls to kill or repel mosquitoes. Pesticides are used to control organisms that are considered to be harmful. For example, they are used to kill mosquitoes that can transmit potentially deadly diseases like West Nile virus, yellow fever, and malaria. They can also kill bees, wasps or ants that can cause allergic reactions. Insecticides can protect animals from illnesses that can be caused by parasites such as fleas. Pesticides can prevent sickness in humans that could be caused by moldy food or diseased produce. Herbicides can be used to clear roadside weeds, trees, and brush. They can also kill invasive weeds that may cause environmental damage. Herbicides are commonly applied in ponds and lakes to control algae and plants such as water grasses that can interfere with activities like swimming and fishing and cause the water to look or smell unpleasant. Uncontrolled pests such as termites and mold can damage structures such as houses. Pesticides are used in grocery stores and food storage facilities to manage rodents and insects that infest food such as grain. Each use of a pesticide carries some associated risk. Proper pesticide use decreases these associated risks to a level deemed acceptable by pesticide regulatory agencies such as the United States Environmental Protection Agency (EPA) and the Pest Management Regulatory Agency (PMRA) of Canada. DDT, sprayed on the walls of houses, is an organochlorine that has been used to fight malaria since the 1950s. Recent policy statements by the World Health Organization have given stronger support to this approach. However, DDT and other organochlorine pesticides have been banned in most countries worldwide because of their persistence in the environment and human toxicity. DDT use is not always effective, as resistance to DDT was identified in Africa as early as 1955, and by 1972 nineteen species of mosquito worldwide were resistant to DDT. In 2006 and 2007, the world used approximately 2.4 megatonnes (5.3×109 lb) of pesticides, with herbicides constituting the biggest part of the world pesticide use at 40%, followed by insecticides (17%) and fungicides (10%). In 2006 and 2007 the U.S. used approximately 0.5 megatonnes (1.1×109 lb) of pesticides, accounting for 22% of the world total, including 857 million pounds (389 kt) of conventional pesticides, which are used in the agricultural sector (80% of conventional pesticide use) as well as the industrial, commercial, governmental and home & garden sectors. The state of California alone used 117 million pounds. Pesticides are also found in majority of U.S. households with 88 million out of the 121.1 million households indicating that they use some form of pesticide in 2012. As of 2007, there were more than 1,055 active ingredients registered as pesticides, which yield over 20,000 pesticide products that are marketed in the United States. The US used some 1 kg (2.2 pounds) per hectare of arable land compared with: 4.7 kg in China, 1.3 kg in the UK, 0.1 kg in Cameroon, 5.9 kg in Japan and 2.5 kg in Italy. Insecticide use in the US has declined by more than half since 1980 (.6%/yr), mostly due to the near phase-out of organophosphates. In corn fields, the decline was even steeper, due to the switchover to transgenic Bt corn. For the global market of crop protection products, market analysts forecast revenues of over 52 billion US$ in 2019. Pesticides can save farmers' money by preventing crop losses to insects and other pests; in the U.S., farmers get an estimated fourfold return on money they spend on pesticides. One study found that not using pesticides reduced crop yields by about 10%. Another study, conducted in 1999, found that a ban on pesticides in the United States may result in a rise of food prices, loss of jobs, and an increase in world hunger. There are two levels of benefits for pesticide use, primary and secondary. Primary benefits are direct gains from the use of pesticides and secondary benefits are effects that are more long-term. Human lives saved and disease reduced. Diseases controlled include malaria, with millions of lives having been saved or enhanced with the use of DDT alone. In one study, it was estimated that for every dollar ($1) that is spent on pesticides for crops can yield up to four dollars ($4) in crops saved. This means based that, on the amount of money spent per year on pesticides, $10 billion, there is an additional $40 billion savings in crop that would be lost due to damage by insects and weeds. In general, farmers benefit from having an increase in crop yield and from being able to grow a variety of crops throughout the year. Consumers of agricultural products also benefit from being able to afford the vast quantities of produce available year-round. On the cost side of pesticide use there can be costs to the environment, costs to human health, as well as costs of the development and research of new pesticides. Pesticides may cause acute and delayed health effects in people who are exposed. Pesticide exposure can cause a variety of adverse health effects, ranging from simple irritation of the skin and eyes to more severe effects such as affecting the nervous system, mimicking hormones causing reproductive problems, and also causing cancer. A 2007 systematic review found that "most studies on non-Hodgkin lymphoma and leukemia showed positive associations with pesticide exposure" and thus concluded that cosmetic use of pesticides should be decreased. There is substantial evidence of associations between organophosphate insecticide exposures and neurobehavioral alterations. Limited evidence also exists for other negative outcomes from pesticide exposure including neurological, birth defects, and fetal death. Owing to inadequate regulation and safety precautions, 99% of pesticide related deaths occur in developing countries that account for only 25% of pesticide usage. One study found pesticide self-poisoning the method of choice in one third of suicides worldwide, and recommended, among other things, more restrictions on the types of pesticides that are most harmful to humans. A 2014 epidemiological review found associations between autism and exposure to certain pesticides, but noted that the available evidence was insufficient to conclude that the relationship was causal. Large quantities of presumably nontoxic petroleum oil by-products are introduced into the environment as pesticide dispersal agents and emulsifiers. A 1976 study found that an increase in viral lethality with a concomitant influence on the liver and central nervous system occurs in young mice previously primed with such chemicals. The World Health Organization and the UN Environment Programme estimate that each year, 3 million workers in agriculture in the developing world experience severe poisoning from pesticides, about 18,000 of whom die. According to one study, as many as 25 million workers in developing countries may suffer mild pesticide poisoning yearly. There are several careers aside from agriculture that may also put individuals at risk of health effects from pesticide exposure including pet groomers, groundskeepers, and fumigators. Pesticide use is widespread in Latin America, as around US $3 billion are spend each year in the region. It has been recorded that pesticide poisonings have been increasing each year for the past two decades. It was estimated that 50–80% of the cases are unreported. It is indicated by studies that organophosphate and carbamate insecticides are the most frequent source of pesticide poisoning. Pesticide use raises a number of environmental concerns. Over 98% of sprayed insecticides and 95% of herbicides reach a destination other than their target species, including non-target species, air, water and soil. Pesticide drift occurs when pesticides suspended in the air as particles are carried by wind to other areas, potentially contaminating them. Pesticides are one of the causes of water pollution, and some pesticides are persistent organic pollutants and contribute to soil and flower (pollen, nectar) contamination. In addition, pesticide use reduces biodiversity, contributes to pollinator decline, destroys habitat (especially for birds), and threatens endangered species. Pests can develop a resistance to the pesticide (pesticide resistance), necessitating a new pesticide. Alternatively a greater dose of the pesticide can be used to counteract the resistance, although this will cause a worsening of the ambient pollution problem. The Stockholm Convention on Persistent Organic Pollutants, listed 9 of the 12 most dangerous and persistent organic chemicals that were (now mostly obsolete) organochlorine pesticides. Since chlorinated hydrocarbon pesticides dissolve in fats and are not excreted, organisms tend to retain them almost indefinitely. Biological magnification is the process whereby these chlorinated hydrocarbons (pesticides) are more concentrated at each level of the food chain. Among marine animals, pesticide concentrations are higher in carnivorous fishes, and even more so in the fish-eating birds and mammals at the top of the ecological pyramid. Global distillation is the process whereby pesticides are transported from warmer to colder regions of the Earth, in particular the Poles and mountain tops. Pesticides that evaporate into the atmosphere at relatively high temperature can be carried considerable distances (thousands of kilometers) by the wind to an area of lower temperature, where they condense and are carried back to the ground in rain or snow. In order to reduce negative impacts, it is desirable that pesticides be degradable or at least quickly deactivated in the environment. Such loss of activity or toxicity of pesticides is due to both innate chemical properties of the compounds and environmental processes or conditions. For example, the presence of halogens within a chemical structure often slows down degradation in an aerobic environment. Adsorption to soil may retard pesticide movement, but also may reduce bioavailability to microbial degraders. In one study, the human health and environmental costs due to pesticides in the United States was estimated to be $9.6 billion: offset by about $40 billion in increased agricultural production. Additional costs include the registration process and the cost of purchasing pesticides: which are typically borne by agrichemical companies and farmers respectively. The registration process can take several years to complete (there are 70 different types of field test) and can cost $50–70 million for a single pesticide. At the beginning of the 21st century, the United States spent approximately $10 billion on pesticides annually. Alternatives to pesticides are available and include methods of cultivation, use of biological pest controls (such as pheromones and microbial pesticides), genetic engineering, and methods of interfering with insect breeding. Application of composted yard waste has also been used as a way of controlling pests. These methods are becoming increasingly popular and often are safer than traditional chemical pesticides. In addition, EPA is registering reduced-risk conventional pesticides in increasing numbers. Release of other organisms that fight the pest is another example of an alternative to pesticide use. These organisms can include natural predators or parasites of the pests. Biological pesticides based on entomopathogenic fungi, bacteria and viruses cause disease in the pest species can also be used. Interfering with insects' reproduction can be accomplished by sterilizing males of the target species and releasing them, so that they mate with females but do not produce offspring. This technique was first used on the screwworm fly in 1958 and has since been used with the medfly, the tsetse fly, and the gypsy moth. However, this can be a costly, time consuming approach that only works on some types of insects. The term "push-pull" was established in 1987 as an approach for integrated pest management (IPM). This strategy uses a mixture of behavior-modifying stimuli to manipulate the distribution and abundance of insects. "Push" means the insects are repelled or deterred away from whatever resource that is being protected. "Pull" means that certain stimuli (semiochemical stimuli, pheromones, food additives, visual stimuli, genetically altered plants, etc.) are used to attract pests to trap crops where they will be killed. There are numerous different components involved in order to implement a Push-Pull Strategy in IPM. Many case studies testing the effectiveness of the push-pull approach have been done across the world. The most successful push-pull strategy was developed in Africa for subsistence farming. Another successful case study was performed on the control of Helicoverpa in cotton crops in Australia. In Europe, the Middle East, and the United States, push-pull strategies were successfully used in the controlling of Sitona lineatus in bean fields. Some advantages of using the push-pull method are less use of chemical or biological materials and better protection against insect habituation to this control method. Some disadvantages of the push-pull strategy is that if there is a lack of appropriate knowledge of behavioral and chemical ecology of the host-pest interactions then this method becomes unreliable. Furthermore, because the push-pull method is not a very popular method of IPM operational and registration costs are higher. Some evidence shows that alternatives to pesticides can be equally effective as the use of chemicals. For example, Sweden has halved its use of pesticides with hardly any reduction in crops. [unreliable source?] In Indonesia, farmers have reduced pesticide use on rice fields by 65% and experienced a 15% crop increase. [unreliable source?] A study of Maize fields in northern Florida found that the application of composted yard waste with high carbon to nitrogen ratio to agricultural fields was highly effective at reducing the population of plant-parasitic nematodes and increasing crop yield, with yield increases ranging from 10% to 212%; the observed effects were long-term, often not appearing until the third season of the study. Pesticides are often referred to according to the type of pest they control. Pesticides can also be considered as either biodegradable pesticides, which will be broken down by microbes and other living beings into harmless compounds, or persistent pesticides, which may take months or years before they are broken down: it was the persistence of DDT, for example, which led to its accumulation in the food chain and its killing of birds of prey at the top of the food chain. Another way to think about pesticides is to consider those that are chemical pesticides are derived from a common source or production method. Neonicotinoids are a class of neuro-active insecticides chemically similar to nicotine. Imidacloprid, of the neonicotanoid family, is the most widely used insecticide in the world. In the late 1990s neonicotinoids came under increasing scrutiny over their environmental impact and were linked in a range of studies to adverse ecological effects, including honey-bee colony collapse disorder (CCD) and loss of birds due to a reduction in insect populations. In 2013, the European Union and a few non EU countries restricted the use of certain neonicotinoids. Organophosphate and carbamate insecticides have a similar mode of action. They affect the nervous system of target pests (and non-target organisms) by disrupting acetylcholinesterase activity, the enzyme that regulates acetylcholine, at nerve synapses. This inhibition causes an increase in synaptic acetylcholine and over-stimulation of the parasympathetic nervous system. Many of these insecticides, first developed in the mid 20th century, are very poisonous. Although commonly used in the past, many older chemicals have been removed from the market due to their health and environmental effects (e.g. DDT, chlordane, and toxaphene). However, many organophosphates are not persistent in the environment. Pyrethroid insecticides were developed as a synthetic version of the naturally occurring pesticide pyrethrin, which is found in chrysanthemums. They have been modified to increase their stability in the environment. Some synthetic pyrethroids are toxic to the nervous system. A number of sulfonylureas have been commercialized for weed control, including: amidosulfuron, flazasulfuron, metsulfuron-methyl, rimsulfuron, sulfometuron-methyl, terbacil, nicosulfuron, and triflusulfuron-methyl. These are broad-spectrum herbicides that kill plants weeds or pests by inhibiting the enzyme acetolactate synthase. In the 1960s, more than 1 kg/ha (0.89 lb/acre) crop protection chemical was typically applied, while sulfonylureates allow as little as 1% as much material to achieve the same effect. Microbial pesticides which consist of bacteria, entomopathogenic fungi or viruses (and sometimes includes the metabolites that bacteria or fungi produce). Entomopathogenic nematodes are also often classed as microbial pesticides, even though they are multi-cellular. Biochemical pesticides or herbal pesticides are naturally occurring substances that control (or monitor in the case of pheromones) pests and microbial diseases. Plant-incorporated protectants (PIPs) have genetic material from other species incorporated into their genetic material (i.e. GM crops). Their use is controversial, especially in many European countries. Defoliants: Cause leaves or other foliage to drop from a plant, usually to facilitate harvest. Desiccants: Promote drying of living tissues, such as unwanted plant tops. Insect growth regulators: Disrupt the molting, maturity from pupal stage to adult, or other life processes of insects. Plant growth regulators: Substances (excluding fertilizers or other plant nutrients) that alter the expected growth, flowering, or reproduction rate of plants. Wood preservatives: They are used to make wood resistant to insects, fungus, and other pests. In many countries, pesticides must be approved for sale and use by a government agency. In Europe, EU legislation has been approved banning the use of highly toxic pesticides including those that are carcinogenic, mutagenic or toxic to reproduction, those that are endocrine-disrupting, and those that are persistent, bioaccumulative and toxic (PBT) or very persistent and very bioaccumulative (vPvB) and measures have been approved to improve the general safety of pesticides across all EU member states. Though pesticide regulations differ from country to country, pesticides, and products on which they were used are traded across international borders. To deal with inconsistencies in regulations among countries, delegates to a conference of the United Nations Food and Agriculture Organization adopted an International Code of Conduct on the Distribution and Use of Pesticides in 1985 to create voluntary standards of pesticide regulation for different countries. The Code was updated in 1998 and 2002. The FAO claims that the code has raised awareness about pesticide hazards and decreased the number of countries without restrictions on pesticide use. Three other efforts to improve regulation of international pesticide trade are the United Nations London Guidelines for the Exchange of Information on Chemicals in International Trade and the United Nations Codex Alimentarius Commission. The former seeks to implement procedures for ensuring that prior informed consent exists between countries buying and selling pesticides, while the latter seeks to create uniform standards for maximum levels of pesticide residues among participating countries. Pesticides safety education and pesticide applicator regulation are designed to protect the public from pesticide misuse, but do not eliminate all misuse. Reducing the use of pesticides and choosing less toxic pesticides may reduce risks placed on society and the environment from pesticide use. Integrated pest management, the use of multiple approaches to control pests, is becoming widespread and has been used with success in countries such as Indonesia, China, Bangladesh, the U.S., Australia, and Mexico. IPM attempts to recognize the more widespread impacts of an action on an ecosystem, so that natural balances are not upset. New pesticides are being developed, including biological and botanical derivatives and alternatives that are thought to reduce health and environmental risks. In addition, applicators are being encouraged to consider alternative controls and adopt methods that reduce the use of chemical pesticides. Pesticides can be created that are targeted to a specific pest's lifecycle, which can be environmentally more friendly. For example, potato cyst nematodes emerge from their protective cysts in response to a chemical excreted by potatoes; they feed on the potatoes and damage the crop. A similar chemical can be applied to fields early, before the potatoes are planted, causing the nematodes to emerge early and starve in the absence of potatoes. In the United States, the Environmental Protection Agency (EPA) is responsible for regulating pesticides under the Federal Insecticide, Fungicide, and Rodenticide Act (FIFRA) and the Food Quality Protection Act (FQPA). Studies must be conducted to establish the conditions in which the material is safe to use and the effectiveness against the intended pest(s). The EPA regulates pesticides to ensure that these products do not pose adverse effects to humans or the environment, with an emphasis on the health and safety of children. Pesticides produced before November 1984 continue to be reassessed in order to meet the current scientific and regulatory standards. All registered pesticides are reviewed every 15 years to ensure they meet the proper standards. During the registration process, a label is created. The label contains directions for proper use of the material in addition to safety restrictions. Based on acute toxicity, pesticides are assigned to a Toxicity Class. Pesticides are the most thoroughly tested chemicals after drugs in the United States; those used on food requires more than 100 tests to determine a range of potential impacts. Some pesticides are considered too hazardous for sale to the general public and are designated restricted use pesticides. Only certified applicators, who have passed an exam, may purchase or supervise the application of restricted use pesticides. Records of sales and use are required to be maintained and may be audited by government agencies charged with the enforcement of pesticide regulations. These records must be made available to employees and state or territorial environmental regulatory agencies. In addition to the EPA, the United States Department of Agriculture (USDA) and the United States Food and Drug Administration (FDA) set standards for the level of pesticide residue that is allowed on or in crops. The EPA looks at what the potential human health and environmental effects might be associated with the use of the pesticide. In addition, the U.S. EPA uses the National Research Council's four-step process for human health risk assessment: (1) Hazard Identification, (2) Dose-Response Assessment, (3) Exposure Assessment, and (4) Risk Characterization. Recently Kaua'i County (Hawai'i) passed Bill No. 2491 to add an article to Chapter 22 of the county's code relating to pesticides and GMOs. The bill strengthens protections of local communities in Kaua'i where many large pesticide companies test their products. Pesticide residue refers to the pesticides that may remain on or in food after they are applied to food crops. The maximum allowable levels of these residues in foods are often stipulated by regulatory bodies in many countries. Regulations such as pre-harvest intervals also often prevent harvest of crop or livestock products if recently treated in order to allow residue concentrations to decrease over time to safe levels before harvest. Exposure of the general population to these residues most commonly occurs through consumption of treated food sources, or being in close contact to areas treated with pesticides such as farms or lawns. Many of these chemical residues, especially derivatives of chlorinated pesticides, exhibit bioaccumulation which could build up to harmful levels in the body as well as in the environment. Persistent chemicals can be magnified through the food chain and have been detected in products ranging from meat, poultry, and fish, to vegetable oils, nuts, and various fruits and vegetables. Pesticide contamination in the environment can be monitored through bioindicators such as bee pollinators. ^ "Basic Information about Pesticide Ingredients". US Environmental Protection Agency. Apr 2, 2018. Retrieved Dec 1, 2018. ^ Randall C, et al. (2014). "Pest Management". National Pesticide Applicator Certification Core Manual (2nd ed.). Washington: National Association of State Departments of Agriculture Research Foundation. ^ "Pesticides in Our Food System". Food Print. GRACE Communications. Retrieved 26 March 2018. ^ a b "International Code of Conduct on the Distribution and Use of Pesticides" (PDF). Food and Agriculture Organization of the United Nations. 2002. Archived from the original (PDF) on 4 April 2013. ^ a b Gilden RC, Huffling K, Sattler B (January 2010). "Pesticides and health risks". Journal of Obstetric, Gynecologic, and Neonatal Nursing. 39 (1): 103–10. doi:10.1111/j.1552-6909.2009.01092.x. PMID 20409108. ^ a b "Educational and Informational Strategies to Reduce Pesticide Risks". Preventive Medicine. 26 (2): 191–200. 1997. doi:10.1006/pmed.1996.0122. ISSN 0091-7435. PMID 9085387. ^ "Types of Pesticide Ingredients". US Environmental Protection Agency. Jan 3, 2017. Retrieved Dec 1, 2018. ^ a b c d e Kamrin MA (1997). Pesticide Profiles: Toxicity, Environmental Impact, and Fate (1st ed.). Boca Raton: CRC. ISBN 978-1566701907. OCLC 35262311. ^ Safe S, Plugge H, Crocker JF (1977). "Analysis of an aromatic solvent used in a forest spray program". Chemosphere. 6 (10): 641–651. doi:10.1016/0045-6535(77)90075-3. ISSN 0045-6535. ^ "Pesticide Applicator Core Tutorial: Module 4 - Toxicity of Pesticides". Pesticide Safety Education Program (PSEP). Cornell University. Retrieved Dec 1, 2018. ^ Rortais A, Arnold G, Halm MP, Touffet-Briens F (2005). "Modes of honeybees exposure to systemic insecticides: estimated amounts of contaminated pollen and nectar consumed by different categories of bees". Apidologie. 36 (1): 71–83. doi:10.1051/apido:2004071. ^ American Chemical Society (2009). "New 'green' pesticides are first to exploit plant defenses in battle of the fungi". EurekAlert!. AAAS. Retrieved Dec 1, 2018. ^ Rao GV, Rupela OP, Rao VR, Reddy YV (2007). "Role of biopesticides in crop protection: present status and future prospects" (PDF). Indian Journal of Plant Protection. 35 (1): 1–9. ^ a b Miller GT (2002). Living in the Environment (12th ed.). Belmont: Wadsworth/Thomson Learning. ISBN 9780534376970. OCLC 819417923. ^ a b c d Ritter SK (2009). "Pinpointing Trends In Pesticide Use In 1939". Chemical & Engineering News. 87 (7). ACS. ISSN 0009-2347. ^ a b c Goldman LR (2007). "Managing pesticide chronic health risks: U.S. policies". Journal of Agromedicine. 12 (1): 67–75. doi:10.1300/J096v12n02_08. PMID 18032337. ^ a b Daly HV, Doyen JT, Purcell AH (1998). "Chapter 14". Introduction to insect biology and diversity (2nd ed.). Oxford: Oxford University Press. pp. 279–300. ISBN 978-0195100334. OCLC 37211384. ^ Murphy G (Dec 1, 2005). "Pesticide Rotation". Ontario Ministry of Agriculture, Food and Rural Affairs. Archived from the original on Oct 13, 2007. Retrieved Sep 15, 2007. ^ a b c d e f g h i j k l m n Miller GT (2004). "Ch. 9. Biodiversity". Sustaining the Earth (6th ed.). Pacific Grove, CA: Thompson Learning, Inc. pp. 211–216. ISBN 9780495556879. OCLC 52134759. ^ Aspelin AL (Feb 2003). "Pesticide Usage in the United States: Trends During the 20th Century" (PDF). NSF CIPM Technical Bulletin 105. Retrieved Oct 28, 2010. ^ Lobe J (Sep 16, 2006). "WHO urges DDT for malaria control Strategies". Common Dreams News Center. Inter Press Service. Archived from the original on Oct 17, 2006. Retrieved Sep 15, 2007. ^ a b c Whitford, F (2009). The Benefits of Pesticides, A Story Worth Telling (PDF). Purdue Extension. ^ a b Helfrich LA, Weigmann DL (Jun 1996). "Pesticides and aquatic animals: A guide to reducing impacts on aquatic systems". Virginia Cooperative Extension. Archived from the original on Mar 5, 2009. Retrieved Oct 14, 2007. ^ "WHO gives indoor use of DDT a clean bill of health for controlling malaria". WHO. Sep 15, 2006. Retrieved Sep 13, 2007. ^ "In Depth: DDT & Malaria". PAN Magazine. Archived from the original on 2008-01-18. ^ "A Story to be Shared: the Successful Fight Against Malaria in Vietnam" (PDF). WHO WPRO. Nov 6, 2000. Archived from the original (PDF) on Oct 5, 2003. ^ "Pesticides Industry Sales and Usage 2008-2012" (PDF). US EPA. 2012. Retrieved 26 March 2012. ^ "U.S.: Number of households 1960-2017". Statista. Retrieved 26 March 2018. ^ a b "Pesticide Illness & Injury Surveillance". Cdc.gov. NIOSH. Feb 7, 2017. Retrieved Jan 28, 2014. ^ "Infographic: pesticide planet". Science. 341 (6147): 730–1. August 2013. doi:10.1126/science.341.6147.730. PMID 23950524. ^ "Market Study: Crop Protection (UC-2805)". Ceresana.com. June 2012. Retrieved 2012-08-09. ^ Kellogg RL, Nehring RF, Grube A, Goss DW, Plotkin S (2002). "Environmental Indicators of Pesticide Leaching and Runoff from Farm Fields". In Ball VE, Norton GW (eds.). Agricultural Productivity. Studies in Productivity and Efficiency. 2. Boston: Springer. pp. 213–56. ISBN 97814613-52709. Archived from the original on Jun 18, 2002. ^ Saitoh K, Kuroda T, Kumano S (2001). "Effects of Organic Fertilization and Pesticide Application on Growth and Yield of Field-Grown Rice for 10 Years". Japanese Journal of Crop Science (in Japanese). 70 (4): 530–540. doi:10.1626/jcs.70.530. ^ Knutson R (1999). "Economic Impact of Reduced Pesticide Use in the United States: Measurement of Costs and Benefits" (PDF). AFPC Policy Issues. 99 (2). ^ a b c d Cooper J, Dobson H (2007). "The benefits of pesticides to mankind and the environment" (PDF). Crop Protection. 26 (9): 1337–1348. doi:10.1016/j.cropro.2007.03.022. Archived from the original (PDF) on Sep 27, 2011. ^ Yamey, G (May 2004). "Roll Back Malaria: a failing global health campaign". BMJ. 328 (7448): 1086–7. doi:10.1136/bmj.328.7448.1086. PMC 406307. PMID 15130956. ^ Pimentel D, Acquay H, Biltonen M, Rice P, Silva M (1992). "Environmental and Economic Costs of Pesticide Use". BioScience. 42 (10): 750–60. doi:10.2307/1311994. JSTOR 1311994. ^ Fantke P, Friedrich R, Jolliet O (November 2012). "Health impact and damage cost assessment of pesticides in Europe". Environment International. 49: 9–17. doi:10.1016/j.envint.2012.08.001. PMID 22940502. ^ "National Assessment of the Worker Protection Workshop #3". Pesticides: Health and Safety. U.S. Environmental Protection Agency. Aug 30, 2007. Archived from the original on Sep 27, 2009. ^ "Human Health Issues". Pesticides: Health and Safety. US EPA. Jun 28, 2006. Archived from the original on May 28, 2015. ^ Bassil KL, Vakil C, Sanborn M, Cole DC, Kaur JS, Kerr KJ (October 2007). "Cancer health effects of pesticides: systematic review". Canadian Family Physician. 53 (10): 1704–11. PMC 2231435. PMID 17934034. ^ Jurewicz J, Hanke W (2008). "Prenatal and childhood exposure to pesticides and neurobehavioral development: review of epidemiological studies". International Journal of Occupational Medicine and Environmental Health. 21 (2): 121–32. doi:10.2478/v10001-008-0014-z. PMID 18614459. ^ Weselak M, Arbuckle TE, Foster W (2007). "Pesticide exposures and developmental outcomes: the epidemiological evidence". Journal of Toxicology and Environmental Health. Part B, Critical Reviews. 10 (1–2): 41–80. doi:10.1080/10937400601034571. PMID 18074304. ^ Wigle DT, Arbuckle TE, Turner MC, Bérubé A, Yang Q, Liu S, Krewski D (May 2008). "Epidemiologic evidence of relationships between reproductive and child health outcomes and environmental chemical contaminants". Journal of Toxicology and Environmental Health. Part B, Critical Reviews. 11 (5–6): 373–517. doi:10.1080/10937400801921320. PMID 18470797. ^ Mink PJ, Mandel JS, Lundin JI, Sceurman BK (November 2011). "Epidemiologic studies of glyphosate and non-cancer health outcomes: a review". Regulatory Toxicology and Pharmacology. 61 (2): 172–84. doi:10.1016/j.yrtph.2011.07.006. PMID 21798302. ^ Sanborn M, Kerr KJ, Sanin LH, Cole DC, Bassil KL, Vakil C (October 2007). "Non-cancer health effects of pesticides: systematic review and implications for family doctors". Canadian Family Physician. 53 (10): 1712–20. PMC 2231436. PMID 17934035. ^ Council On Environmental Health (December 2012). "Pesticide exposure in children". Pediatrics. 130 (6): e1757–63. doi:10.1542/peds.2012-2757. PMC 5813803. PMID 23184103. ^ Goldmann, L (May 2004). "Childhood Pesticide Poisoning: Information for Advocacy and Action" (PDF) (Report). WHO. ^ Gunnell D, Eddleston M, Phillips MR, Konradsen F (December 2007). "The global distribution of fatal pesticide self-poisoning: systematic review". BMC Public Health. 7 (1): 357. doi:10.1186/1471-2458-7-357. PMC 2262093. PMID 18154668. ^ Kalkbrenner AE, Schmidt RJ, Penlesky AC (November 2014). "Environmental chemical exposures and autism spectrum disorders: a review of the epidemiological evidence". Current Problems in Pediatric and Adolescent Health Care. 44 (10): 277–318. doi:10.1016/j.cppeds.2014.06.001. PMC 4855851. PMID 25199954. ^ Crocker, JF; Ozere, RL; Safe, SH; et al. (Jun 25, 1976). "Lethal interaction of ubiquitous insecticide carriers with virus". Science. 192 (4246): 1351–1353. doi:10.1126/science.179146. ISSN 0036-8075. PMID 179146. ^ Jeyaratnam J (1990). "Acute pesticide poisoning: a major global health problem". World Health Statistics Quarterly. Rapport Trimestriel de Statistiques Sanitaires Mondiales. 43 (3): 139–44. PMID 2238694. ^ Laborde, A; Tomasina, F; Bianchi, F; et al. (2015). "Children's Health in Latin America: The Influence of Environmental Exposures". Environmental Health Perspectives. 123 (3): 201–209. doi:10.1289/ehp.1408292. ISSN 0091-6765. PMC 4348745. PMID 25499717. ^ a b Tosi, Simone; Costa, Cecilia; Vesco, Umberto; Quaglia, Giancarlo; Guido, Giovanni (2018). "A survey of honey bee-collected pollen reveals widespread contamination by agricultural pesticides". Science of the Total Environment. 615: 208–218. doi:10.1016/j.scitotenv.2017.09.226. ^ Wells M (March 11, 2007). "Vanishing bees threaten U.S. crops". www.bbc.co.uk. London: BBC News. Retrieved 2007-09-19. ^ Palmer WE, Bromley PT, Brandenburg RL. "Wildlife & Pesticides - Peanuts". North Carolina Cooperative Extension Service. Archived from the original on 17 February 2008. Retrieved 11 October 2007. ^ "Ridding The World of Pops: A Guide to the Stockholm Convention on Persistent Organic Pollutants" (PDF). United Nations Environment Programme. April 2005. Archived from the original (PDF) on 15 March 2017. Retrieved 5 February 2017. ^ Castro P, Huber ME (2010). Marine Biology (8th ed.). New York: McGraw-Hill Companies Inc. ISBN 9780073524160. OCLC 488863548. ^ Quinn AL (2007). The impacts of agricultural chemicals and temperature on the physiological stress response in fish (MSc Thesis). Lethbridge: University of Lethbridge. ^ Sims GK, Cupples AM (1999). "Factors controlling degradation of pesticides in soil". Pesticide Science. 55 (5): 598–601. doi:10.1002/(SICI)1096-9063(199905)55:5<598::AID-PS962>3.0.CO;2-N. ISSN 1096-9063. ^ Sims GK, Sommers LE (1986). "Biodegradation of pyridine derivatives in soil suspensions". Environmental Toxicology and Chemistry. 5 (6): 503–509. doi:10.1897/1552-8618(1986)5[503:bopdis]2.0.co;2. ^ Wolt JD, Smith JK, Sims JK (1996). "Products and kinetics of cloramsulam-methyl aerobic soil metabolism". J. Agric. Food Chem. 44: 324–332. doi:10.1021/jf9503570. ^ a b c Pimentel D (2005). "Environmental and Economic Costs of the Application of Pesticides Primarily in the United States" (PDF). Environment, Development and Sustainability. 7 (2): 229–252. doi:10.1007/s10668-005-7314-2. ^ a b McSorley R, Gallaher RN (December 1996). "Effect of yard waste compost on nematode densities and maize yield". Journal of Nematology. 28 (4S): 655–60. PMC 2619736. PMID 19277191. ^ Shelton AM, Badenes-Perez FR (Dec 6, 2005). "Concepts and applications of trap cropping in pest management". Annual Review of Entomology. 51 (1): 285–308. doi:10.1146/annurev.ento.51.110104.150959. PMID 16332213. ^ Holden MH, Ellner SP, Lee D, Nyrop JP, Sanderson JP (2012-06-01). "Designing an effective trap cropping strategy: the effects of attraction, retention and plant spatial distribution". Journal of Applied Ecology. 49 (3): 715–722. doi:10.1111/j.1365-2664.2012.02137.x. ^ "The Biological Control of Pests". Jul 25, 2007. Archived from the original on Sep 21, 2007. Retrieved Sep 17, 2007. ^ Summerlin LB, ed. (1977). "Chapter 17: Life Sciences". Skylab, Classroom in Space. Washington: MSFC. Retrieved Sep 17, 2007. ^ a b Cook SM, Khan ZR, Pickett JA (2007). "The use of push-pull strategies in integrated pest management". Annual Review of Entomology. 52 (1): 375–400. doi:10.1146/annurev.ento.52.110405.091407. PMID 16968206. ^ "Pesticides 101 - A primer on pesticides, their use in agriculture and the exposure we face". Pesticide Action Network. Retrieved 2014-01-28. ^ "Types of Pesticides". US EPA. Archived from the original on Mar 28, 2013. Retrieved Feb 20, 2013. ^ Yamamoto I (1999). "Nicotine to Nicotinoids: 1962 to 1997". In Yamamoto I, Casida J (eds.). Nicotinoid Insecticides and the Nicotinic Acetylcholine Receptor. Tokyo: Springer-Verlag. pp. 3–27. ISBN 978-4-431-70213-9. OCLC 468555571. ^ Cressey, D (2013). "Europe debates risk to bees". Nature. 496 (7446): 408. doi:10.1038/496408a. ISSN 1476-4687. PMID 23619669. ^ Gill, RJ; Ramos-Rodriguez, O; Raine, NE (2012). "Combined pesticide exposure severely affects individual- and colony-level traits in bees". Nature. 491 (7422): 105–108. doi:10.1038/nature11585. ISSN 1476-4687. PMC 3495159. PMID 23086150. ^ Dicks, L (2013). "Bees, lies and evidence-based policy". Nature. 494 (7437): 283. doi:10.1038/494283a. ISSN 1476-4687. PMID 23426287. ^ Stoddart, C (2012). "The buzz about pesticides". Nature. doi:10.1038/nature.2012.11626. ISSN 1476-4687. ^ Osborne, JL (2012). "Ecology: Bumblebees and pesticides". Nature. 491 (7422): 43–45. doi:10.1038/nature11637. ISSN 1476-4687. PMID 23086148. ^ Cressey, D (2013). "Reports spark row over bee-bothering insecticides". Nature. doi:10.1038/nature.2013.12234. ISSN 1476-4687. ^ "Bees & Pesticides: Commission goes ahead with plan to better protect bees". 30 May 2013. Archived from the original on Jun 21, 2013. ^ Colović MB, Krstić DZ, Lazarević-Pašti TD, Bondžić AM, Vasić VM (May 2013). "Acetylcholinesterase inhibitors: pharmacology and toxicology". Current Neuropharmacology. 11 (3): 315–35. doi:10.2174/1570159X11311030006. PMC 3648782. PMID 24179466. ^ "Public Health Statement for DDT, DDE, and DDD" (PDF). atsdr.cdc.gov. ATSDR. Sep 2002. Retrieved Dec 9, 2018. ^ "Medical Management Guidelines (MMGs): Chlordane". atsdr.cdc.gov. ATSDR. Apr 18, 2012. Retrieved Dec 9, 2018. ^ "Toxicological Profile for Toxaphene" (PDF). ntp.niehs.nih.gov. ATSDR. Aug 1996. p. 5. Retrieved Dec 9, 2018. ^ Soderlund D (2010). "Chapter 77 – Toxicology and Mode of Action of Pyrethroid Insecticides". In Kreiger R (ed.). Hayes' Handbook of Pesticide Toxicology (3 ed.). Academic Press. pp. 1665–1686. ISBN 978-0-12-374367-1. OCLC 918401061. ^ Appleby AP, Müller F, Carpy S (2002). "Weed Control". Ullmann's Encyclopedia of Industrial Chemistry. Weinheim: Wiley-VCH. doi:10.1002/14356007.a28_165. ISBN 978-3-527-30385-4. ^ "Nicosulfuron". EXTOXNET. Retrieved 9 May 2013. ^ "Conclusion regarding the peer review of the pesticide risk assessment of the active substance triflusulfuron". EFSA Journal. 7 (4): 195. 2009. doi:10.2903/j.efsa.2009.195r. ISSN 1831-4732. ^ Lamberth C, Jeanmart S, Luksch T, Plant A (August 2013). "Current challenges and trends in the discovery of agrochemicals". Science. 341 (6147): 742–6. doi:10.1126/science.1237227. PMID 23950530. ^ Coombs A. "Fighting Microbes with Microbes". The Scientist. Retrieved 18 April 2013. ^ Borgio JF, Sahayaraj K, Susurluk IA, eds. (2011). Microbial Insecticides: Principles and Applications. New York: Nova Science Publishers. p. 492. ISBN 9781619427709. OCLC 780442651. ^ Pal, GK; Kumar, B (2013). "Antifungal activity of some common weed extracts against wilt causing fungi, Fusarium oxysporum". Current Discovery. 2 (1): 62–67. ISSN 2320-4400. Archived from the original on Dec 9, 2018 – via Academia. ^ "Plant Incorporated Protectants (PIPs) / Genetically Modified Plants". npic.orst.edu. US NPIC. Feb 9, 2017. Retrieved Dec 9, 2018. ^ a b c Willson HR (1996). "Pesticide Regulations". In Radcliffe EB, Hutchison WD, Cancelado RE (eds.). Radcliffe's IPM World Textbook. St. Paul: University of Minnesota. Archived from the original on Jul 13, 2017. ^ "Laws of Malaysia. Act 149: Pesticides Act 1974" (PDF). pest-aside.com.my. Jun 1, 2015. Retrieved Dec 10, 2018. ^ "MEPs approve pesticides legislation". europarl.europa.eu. EU Parliament. Jan 13, 2009. Archived from the original on Feb 1, 2009. Retrieved Dec 10, 2018. ^ "Programmes: International Code of Conduct on the Distribution and Use of Pesticides". UN FAO. Archived from the original on Dec 2, 2008. ^ Reynolds, JD (1997). "International Pesticide Trade: Is There any Hope for the Effective Regulation of Controlled Substances?". Journal of Land Use & Environmental Law. 13 (1): 69–105. JSTOR 42842699. Archived from the original on May 27, 2012. ^ a b c NWO (Oct 11, 2001). "Environmentally-Friendly Pesticide To Combat Potato Cyst Nematodes". ScienceDaily. Retrieved Dec 10, 2018. ^ a b "Pesticides and Public Health". Pesticides: Health and Safety. US EPA. 2015-08-20. Archived from the original on Jan 14, 2014. Retrieved Dec 10, 2018. ^ "Data Requirements for Pesticide Registration". Pesticides: Regulating Pesticides. US EPA. 2015-08-20. Archived from the original on Apr 1, 2013. Retrieved Dec 10, 2018. ^ a b Susan Wayland and Penelope Fenner-Crisp. “Reducing Pesticide Risks: A Half Century of Progress.” EPA Alumni Association. March 2016. ^ "Protocol for Conducting Environmental Compliance Audits under the Federal Insecticide, Fungicide, and Rodenticide Act (FIFRA)" (PDF). epa.gov. US EPA. 2011. Archived from the original (PDF) on Aug 1, 2014. Retrieved Dec 10, 2018. ^ "Ch. 11. Restricted-Use Pesticides: Dealer and Applicator Records Inspections" (PDF). Federal Insecticide, Fungicide, and Rodenticide Act (FIFRA) Inspection Manual. Washington: US EPA. 2013. pp. 11–1–11–4. ^ "Chemical Hazard Communication". United States Department of Labor; OSHA. 1998. ^ "Emergency Planning and Community Right-to-Know Act (EPCRA)". US EPA. Jul 24, 2013. Retrieved Dec 10, 2018. ^ Toth SJ (Mar 1996). "Federal Pesticide Laws and Regulations" (PDF). North Carolina Cooperative Extension Service. Archived from the original (PDF) on Apr 3, 2015. Retrieved Dec 10, 2018. ^ "Pesticide Registration Program". Pesticides: Topical & Chemical Fact Sheets. US EPA. 2010. Archived from the original on Feb 12, 2011. Retrieved Feb 25, 2011. ^ "Assessing Health Risks from Pesticides". Pesticides: Topical & Chemical Fact Sheets. US EPA. Apr 5, 2007. Archived from the original on Apr 1, 2014. Retrieved Dec 10, 2018. ^ "Bill No. 2491, Draft 2" (PDF). Council of the County of Kaua‘i. October 17, 2013. ^ McNaught AD, Wilkinson A, eds. (1987). "Pesticide Residue". Compendium of Chemical Terminology (2nd ed.). Oxford: Blackwell. doi:10.1351/goldbook.P04520. ISBN 978-0-9678550-9-7. OCLC 901451465. XML on-line corrected version created by Nic M, Jirat J, Kosata B; updates compiled by Jenkins A. ^ "Pesticide Residues in Food". US EPA. Dec 5, 2011. Archived from the original on Nov 4, 2013. Retrieved Dec 10, 2018. ^ Crinnion WJ (Dec 2009). "Chlorinated pesticides: threats to health and importance of detection". Alternative Medicine Review. 14 (4): 347–59. PMID 20030461. ^ Chung SW, Chen BL (Aug 2011). "Determination of organochlorine pesticide residues in fatty foods: a critical review on the analytical methods and their testing capabilities". Journal of Chromatography A. 1218 (33): 5555–67. doi:10.1016/j.chroma.2011.06.066. PMID 21742333. S.Safe; H.Plugge; J.F.S.Crocker (1977). "Analysis of an aromatic solvent used in a forest spray program". Chemosphere. 6 (10). pp. 641–651. doi:10.1016/0045-6535(77)90075-3. 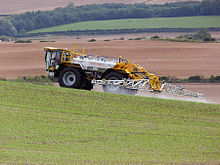 Wikimedia Commons has media related to Pesticides.